For almost a year now, Android users have been speculating, and at one point even “confirmed,” that the next Android version would be code named “Key Lime Pie.” At Google I/O 2013, the Mountain View company alluded to the accuracy of those rumors by sharing a video presentation of a little Android eating some key lime pie. Today, nearly four months later, Google finally announced that its next release will not be code named after the tangy pie, but instead will be code named after the chocolate candy bar, KitKat. Not only were rumors incorrect regarding the new version name, they were also incorrect regarding the new version number. 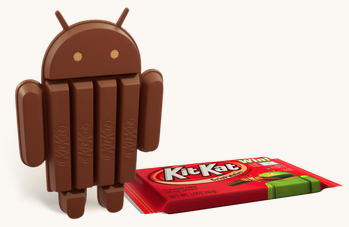 As was previously thought, Android 5.0 will not be the next Android release, rather it will be Android 4.4. With every new release, Google stepped up its game in making Android the world’s leading mobile operating system. With Jelly Bean, came Project Butter and a faster, smoother experience. Android design was refined with Ice Cream Sandwich, along with a merger of the previously disparate phone and tablet branches. Optimized for tablets, Honeycomb opened up the world to a new type of mobile computing. Gingerbread’s new sensor access and APIs made mobile gaming more enticing. Froyo brought massive performance increases with JIT compilation. Eclair helped distinguish Android from iOS by allowing users to customize their home screens with features such as live wallpapers. And Cupcake and Donut introduced the operating system to the world, giving users a viable alternative to other mobile platforms of the day. Although no further details have been released about Kit Kat 4.4, Google did provide a little teaser as to what should be expected. In its announcement, the company said, “It’s our goal with Android KitKat to make an amazing Android experience available for everybody.” Although that certainly does not say much, the statement is sure to be the culprit of many rumors to come.